French unions, students and undocumented workers have been in the streets day and night to reject the anti-labor reform pushed through the government without a vote. This struggle helps all of us fighting austerity, racism, & police terror. Militancy & solidarity are our greatest weapons. It’s class war–which side are you on? -Read about the ongoing, militant struggle that the corporate media does’t want you to know about. CLICK HERE. -Sign on to the CALL below. -Plan a solidarity action for June 14, 2016, when a General Strike has been called in France. See FB Event. ….For those in NYC: French Consulate 934 5th Avenue between 74th & 75th Streets, Manhattan; 4:00 p.m. EDT. FB Event. This action precedes an important Report back from US Solidarity delegation to 19th Anniv. Celebration of RUE MUMIA-ABU JAMAL in Saint-Denis, France- 6:30 pm; Get the flier for both actions. -Pass a SOLIDARITY RESOLUTION. See example from USWA 8751: Boston School Bus Drivers (sent for nationwide May Day march). “A message to the French working class-Solidarity across the Atlantic.” Version translated to FRENCH>>Click here . Picture taken in solidarity with French workers struggle! We, the undersigned, express our support for the ongoing mobilization of France’s workers in a coalition led by the General Confederation of Labor (CGT), and of the Nuit Debout movement consisting primarily of youth and students, against austerity attacks contained in that country’s so-called Labor Reform Law. This law, which was pushed through by the government and corporate vultures, will only serve to drive down the standard of living for current and future generations. The demand to retain a 35-hour work week, with overtime paid after that, is part of the continuum that includes the often raised ‘30 hours work for 40 hours pay’ as a solution to unemployment in the U.S., and the current low-wage workers’ demand for $15 an hour and predictable scheduling. The multinational French working class is using many forms of strikes, occupations and street protest, all of which illustrate who has the real power in society. On one day, no corporate newspapers were printed and on another, 40% of mass transit was shut down. 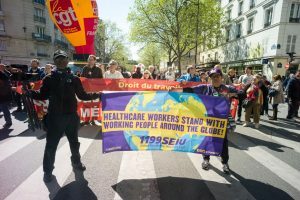 This is happening despite the extension of a state of emergency (six months after the concert hall tragedy), the extreme militarization of the French police forces, and use of chemical gases– such as our sisters from SEIU 1199 and our brother from APWU suffered from while in Paris waiting to join the 2016 May Day parade. We call on United States and other countries’ unions and other workers’ organizations, community groups and youth groups to exchange information with the French CGT and student leaders via satellite, radio, and written interviews with reliable translators. We further urge everyone to support the June 14 general strike in France via resolutions, educational meetings, and rallies at the nearest French consulate. [Those of us in the New York City area intend to gather near the French Consulate at 934 5th Avenue that day between 4:00 and 6:00 p.m. EDT]. To sign on to this call, please contact the Ad Hoc Committee to Support French Workers c/o Johnnie Stevens at nysckrs@gmail.com.